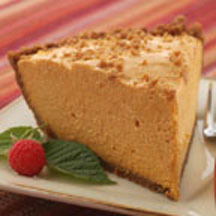 Impress your family and friends with this delicious pumpkin chiffon pie complimented with a gingersnap cookie crust. Preheat oven to 350°F (175°C). Grease 9-inch deep-dish pie plate. For Crust: Combine crumbs and sugar in medium bowl. Stir in butter. Reserve 1/3 cup crumb mixture for topping. Press remaining crumb mixture onto bottom and up sides of prepared pie plate. For Filling: Place gelatin in small saucepan. Pour water over gelatin; let stand for 1 minute. Heat over low heat, stirring often, until gelatin is dissolved. Add evaporated milk; heat, stirring frequently, until just hot (not boiling). Remove from heat. Beat pumpkin pie mix, pudding mix, evaporated milk & gelatin mixture and pumpkin pie spice in large mixer bowl on high speed for 3 minutes. Carefully fold in whipped topping. Spoon mixture into crumb crust. Sprinkle with reserved crumb mixture. Refrigerate for 2 hours or until firm enough to cut.